For your next Friday evening, all you need is a good movie, couple of chilled beers and juicy, succulent, crispy fish. You wouldn’t even crave and care to eat anything else. Just wash, marinade and fry – that’s all it takes to enjoy a really delicious, finger-licking fish. Smear lemon juice and salt generously on the fishes. Cut longitudinally at multiple places so that it absorbs the spices well. Marinade at room temperature or refrigerate for at least an hour. 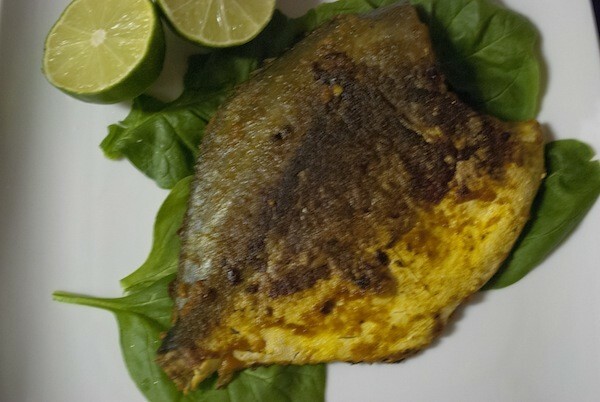 Rub turmeric, chilli powder, cumin powder, coriander powder, ginger garlic paste, all purpose flour and cream of wheat on both sides of the fishes. Drain away the water from lemon juice. Marinade further for 15 minutes. If your fish is really big and fat, split each into two pieces. Fry one by one in a big pan on low heat, for 20 minutes, and turn around once or twice. Cook over high heat for that crisp texture for a minute, on each side, just before removing from fire. Add a dash of lemon juice before serving, and get ready to turn an ordinary Friday into a Fryday special.